Here at Detail King we like to give auto detailers and car enthusiast all the tools necessary in a single place. 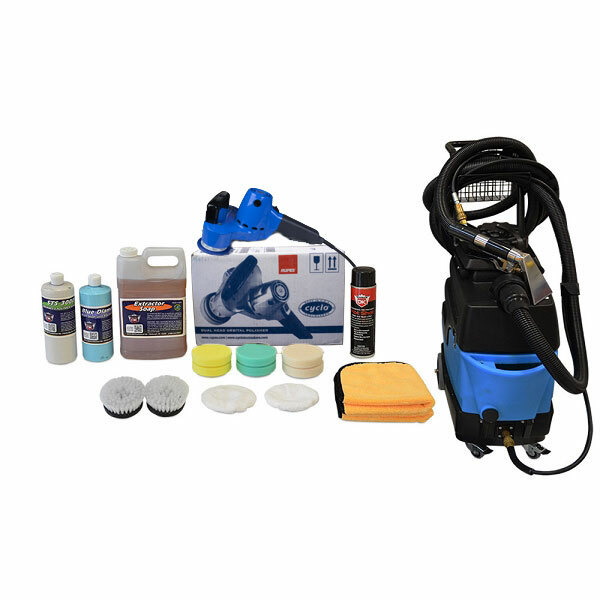 This Detail King Cyclo Orbital Polisher Package comes standard with the Cyclo Model 5 Pro and Mytee Lite 8070 Carpet Extractor. This Cyclo package is perfect for the individual just starting to offer detailing, to aid in the performance of completing an exterior and interior detail. Easilly polish with our Blue Diamond Polish to remove light imperfections & swirls plus this product will add paint protection while restoring a wet look shine. Finish all your hard work off with Detail King's STS 3000 Polymer Paint Sealant. Unlike other sealants, this products will last 12 months and keep your detail jobs looking superb. Additionally, this package comes with Cyclo White Bristle Brushes. Using these will allow you to thoroughly scrub everything from carpets & floor mats to convertible roofs & tonneau covers. Detail vehicles from the inside out and receive overwhelmingly perfect results with Detail King's Cyclo Polisher package!